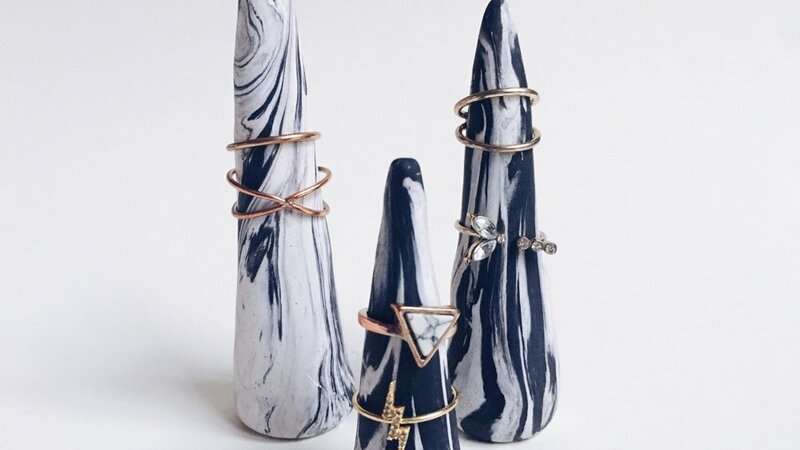 While scrolling through Pinterest recently, I stumbled upon a set beautiful ceramic ring cones with gold specs on them. Sadly, I was not a fan of the price point. Obviously, I would love to support all the creatives out there but sometimes my wallet doesn't agree (we all know this feeling haha). This inspired to create my own or at least attempt to. I love working with clay and I've perfected my clay marble technique so I figured that was a good start. I feel like I say everything is easy when indeed it might be hard for others but I promise this DIY project really is easy. The hardest part of the tutorial might be the marble effect but even if that doesn't turn out well it'll still have a cool psychedelic effect. The most important aspect is to have fun with it. Playing with clay takes you back to childhood when you used to sculpt with Playdoh but now you're making beautiful cones to put your pretty jewelry on! 1) Create a ball of clay and add two little blobs of the contrast color to the white clay. Start molding the clay together and you will see the marble effect start to form. 2) While molding the clay, if you would like more of the contrast color simply add it in. 4) Roll the ball into a cylindrical shape with your palms. Imagine rubbing your palms together to warm them up but instead there is a ball of clay between your hands. 5) Roll the top of the tube to a point. It's perfectly fine if the cones aren't perfect Mine are far from perfect cones but I believe that adds to the appeal. In order to make the cone stand, slap it down firmly on a hard flat surface. This molds the bottom of the cone and if it still seems unstable continue molding it on a flat surface. 6) Lastly, bake the cone (this will vary depending on the brand of clay you purchase) Warning: Make sure not to over bake the clay because it could alter the color (I learned this the hard way).